On October 24-25 in the Wieliczka Salt Mine Spa, the 15th International Symposium of Speleotherapy took place, in which we had the honor to participate. The conference has a long tradition. Specialists involved in speleotherapy and halotherapy are invited to participate – scientists, doctors, as well as managers managing underground treatment centers in inactive salt mines. The symposium takes place every 2-3 years and is attended by the most renowned specialists from around the world who have extensive experience in the treatment of salt aerosols. Scientists met for the fifteenth time and the organization of the symposium took place in 2014 in the Wieliczka Salt Mine Spa. The participants of this year’s Symposium were scientists from many countries specializing in treatment in underground salt chambers. The meeting was divided into several thematic sessions. The day of October 25, 2014 was devoted entirely to halotherapy. Specialists from different countries, based on extensive experience, presented the results of their own clinical trials demonstrating the high efficiency of halotherapy. 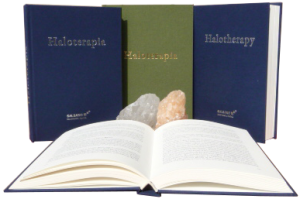 Exchange of experience in the world of medical authorities from around the world allows the use of halotherapy in relation to the greater number of diseases afflicting contemporary society.